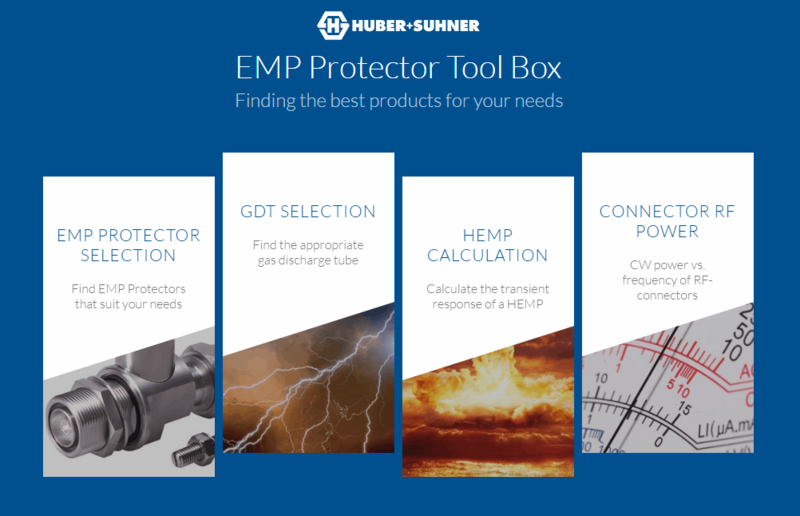 The EMP Protector Tool Box will help to select the right protector for your specific applications. Furthermore, it allows the user to calculate the correct gas capsule size for the GDT series and gives you guidance on the interface power handling capabilities. HUBER+SUHNER offers the Model 9078 high power limiter featuring a combination of lightning and HPM protection in one unit. It is used in a variety of defense applications including Electronic Intelligence (ELINT), Signals Intelligence (SIGINT), Command, Control, Communication Intelligence, Surveillance and Reconnaissance (C³ISR) or Ship’s Signal Exploitation. HUBER+SUHNER offers a wide range of hermetically sealed and precision adaptors in various configurations ideal for lab and production test applications where measurement accuracy, repeatability, and optimum electrical performance are critical. The HUBER+SUHNER CT product family is developed for phase critical applications requiring precision electrical length connectivity. They create a stable and reliable interconnect solution to satisfy a huge range of customer applications where phase stability is key. These products provide the industry leading phase vs. temperature performance, as well as a unique range of cable constructions to fulfill any customer demands. HUBER+SUHNER offers the CUBO Converter Outdoor Unit as an environmentally robust modular high-density platform that combines multi-protocol transport for Radio Access Networks and metro applications. The unit deliver quick and simple installation and implementation within a wide range of applications including media conversion, transmission protection, and performance monitoring all in a compact and flexible design. HUBER+SUHNER’s RADOX®, or “radiation X-linked” technology, describes the process of crosslinking thermoplastic polymers by means of electron beams. This technology is used to improve the thermal, mechanical, and chemical properties of cable insulation materials. RADOX® cables do not melt, possess better abrasion resistance and greater cut resistance than conventional cables and, even with thinner insulation, are much more resistant to various environmental factors. HUBER+SUHNER’s Power Sub-Miniature (PSM) connector interface is designed to maximize performance on power handling while minimizing overall system weight and size. Especially developed for space flight, high altitude platforms, TVAC environments, this space qualified per MIL-PRF-39012 and ESCC 3402 interface is extremely cost effective, and power and weight sensitive for the most demanding aerospace applications. Tesla, Google, and established car makers with vehicles that have an integrated autopilot function, have reached important milestones on the way to the self-propelled car. Thanks to distance radar antennas from HUBER+SUHNER, the dream of autonomous driving now comes a little closer. HUBER+SUHNER offers the MXPM multicoax solution supporting measurements up to 70 GHz (with an option to 80 GHz). The MXPM unit guarantees satisfactory performance and affordability with its high density pitch (2.54 mm, 0.1 inch) and a user friendly magnet mount connection. 5G technologies demand wireless infrastructures able to accommodate both present and future technologies while maintaining excellence in connectivity. With a move to C-RAN architectures in data centers, the hub becomes the most important area with potentially hundreds or thousands of connections to be housed and managed, and vital network elements to be link seamlessly with each other as an optimized system.